We will arrive before your ceremony to make sure that the ceremonial additions are in place (e.g. sand and pebble ceremony, wine and wine glasses, etc.). We'll also communicate with musicians, readers, sound people and your wedding organizer (if you have one). We will have cards ready to give readers, and extra copies of the ceremony for the sound person so that he/she will come in on time for those important moments. We'll be available to reassure those in the wedding procession, and to facilitate that process if necessary. We endeavor to communicate with all those involved so as to help everyone feel confident and assured that their participation is just right. During the ceremony we adjust to whatever arises. The bride's crinoline slip is arriving later than the ceremony was meant to start - we patiently wait with the bridal party. A plane flies overhead - we quietly wait so that everyone can hear us. 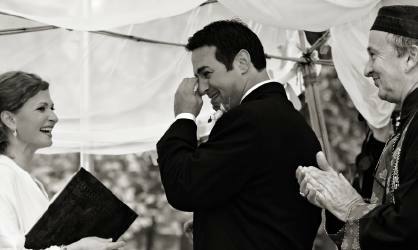 The bride or groom starts crying - we offer you a sip of water and reassure you that your feelings are quite appropriate. We pause for a few breaths and then continue. People generally think that we are your good friends rather than hired professionals - and, in a way, they are right. Through the process of working so closely together on the core piece of your wedding celebration - the ceremony - we do become good friends. This is such a special moment for the two of you that we want to help you in every way we can!